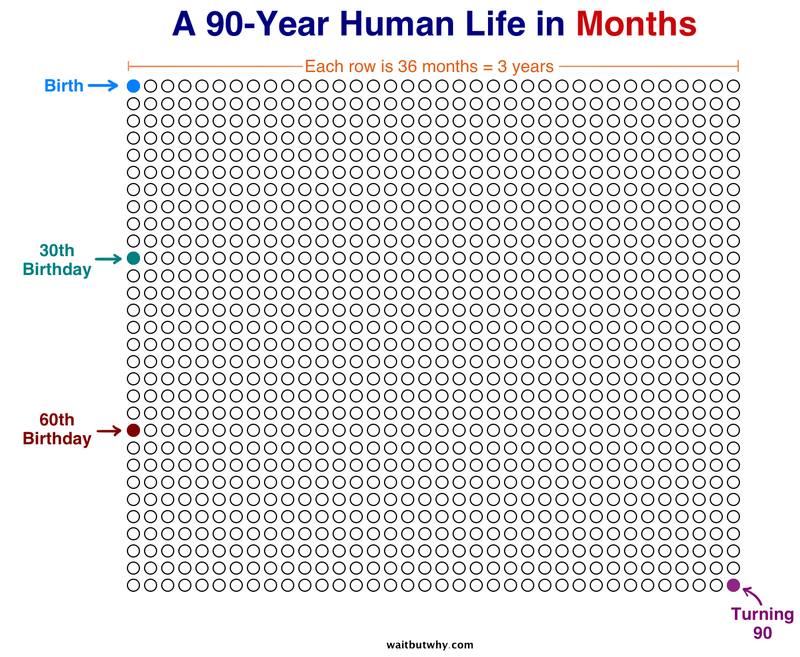 I came across the interesting visualizations found below–which convey the briefness and fleetingness of a human life–at the blog waitbutwhy.com. Some may find them depressing. Perhaps they enjoy their lives and don’t want to contemplate their brevity, or maybe they detest their lives and realize how little time they have to change them. Others may find the visuals uplifting. Perhaps they help them realize a life is precious and shouldn’t be wasted, or maybe they find consolation that some suffering they endure is not interminable. Whether you find the visuals depressing or uplifting, they communicate the reality of the brevity of a human life is. So remember life is short. Enjoy it and try to help others or your time has been wasted. Here are the visuals. This is a long human life in years. This is a long human life in months. This is a long human life in weeks. Each row of weeks makes up one year. 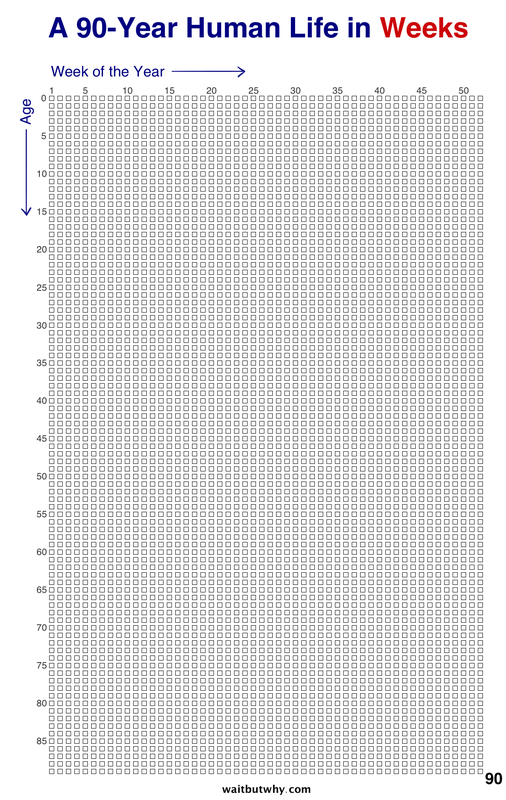 That’s how many weeks it takes to turn a newborn into a 90-year-old. It feels like our lives are made up of a countless number of weeks. But there they are—fully countable—staring you in the face. Conclusion – Well there it is; that’s your brief life. You may think that having 20 or 40 or 60 years to live is a long time, but that’s only 240 or 480 or 720 months. And a month goes by quickly. Enjoy your life while you can and help others. If you do you will have few regrets. Why Do People Fear Immortality? 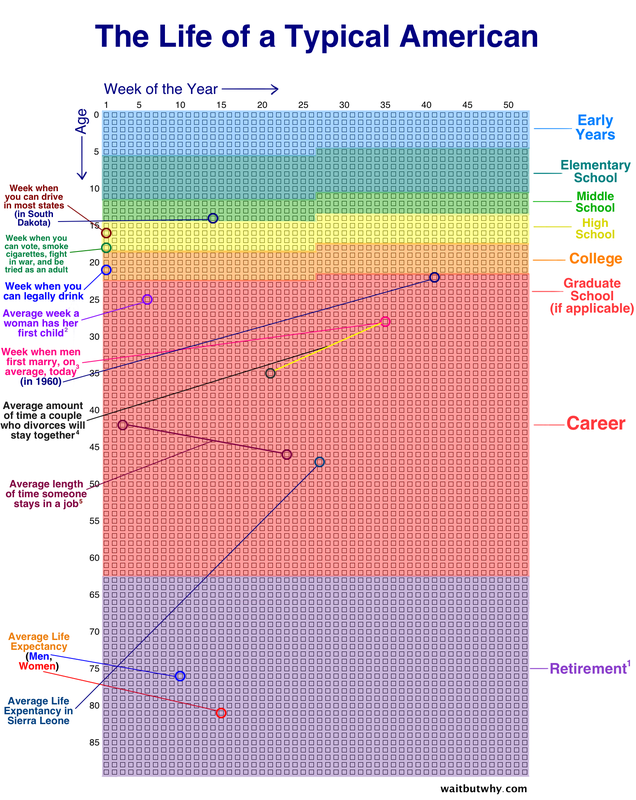 I think about this a lot when planning out future years, when I’ll likely be finished school, time I’ll have to safely biologically have children, etc etc, it really is a big ticking clock that’s running long before the individual cares to give it all any thought.